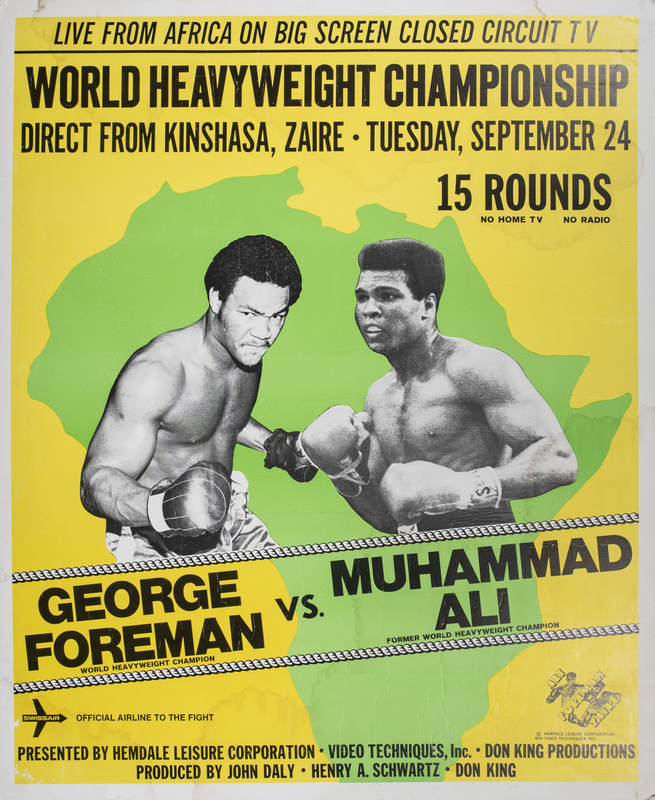 In 1974, Muhammad Ali executed one of the most outstanding fights of his career against George Foreman, upsetting the young, undefeated title holder in an eight-round stunner at the 20th of May Stadium in Kinshasa, Zaire. Ali won the fight thanks to his innovative “rope-a-dope” tactic of absorbing Foreman’s thundering blows as the young champion tired himself out. In the eighth round Ali exploded, unloading a straight right to Foreman’s face that sent the pugilist crashing to the canvas. 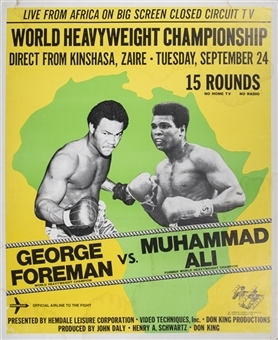 This poster advertises a closed-circuit viewing of the fight in America, with the date of September 25th listed. The fight was originally supposed to occur on the 24th of September in Kinshasa (the 25th in the States with the time difference taken into account), but due to a cut suffered by Foreman in training the fight was pushed back to October 30th. This poster measures 39 x 46 inches and is in very good condition, save for several small moisture stains.